If you’re a wine lover traveling in Alentejo, don’t miss the chance to visit a wonderful winery called Adega Mayor. It is located in Campo Maior, a region on Portugal’s border with Spain that was once the stage of fierce battles between the two countries. Adega Mayor was designed by Álvaro Siza Vieira, a Portuguese architect who received the Pritzker prize. He is famous for his ability to create buildings that are in harmony with their surroundings. At Adega Mayor, he succeeded brilliantly. 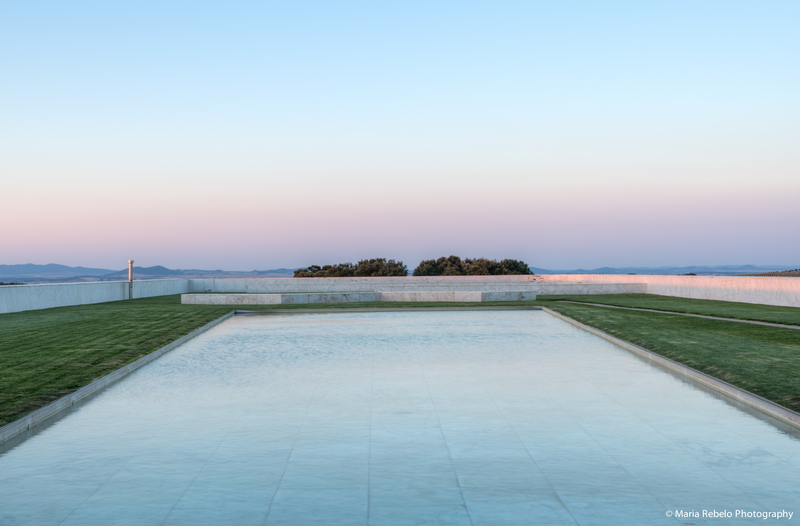 The winery is a subtle white accent on the Alentejo landscape, toped by a terrace with amazing vistas. It is extraordinary to sit on the terrace at sunset and watch the Alentejo sky painted with colors others skies can only dream of. The wines of Adega Mayor are produced with immense skill and care. But they offer much more than technical perfection. They carry in them the soul of Alentejo. We left Adega Mayor with a warm feeling of optimism. We saw ancient battle fields turned into peaceful vineyards that produce extraordinary wines. Click here for Adega Mayor’s website. A minha região preferida..foi um verão espantoso aquele do 2012 que fiz no Alentejo..que bonitas memorias!